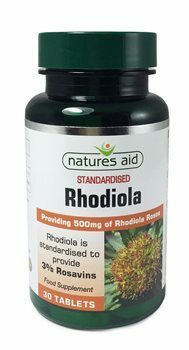 Natures Aid Rhodiola is standardised to privide 3% rosavins. Rhodiola Rosea Extractr Prep. (Rhodiola Rosesa Extract, Maltodextrin, Silicon Dioxide), Microcrystalline Cellulose, Di-Calcium Phosphate, Sodium Carboxymethylcellulose, Anticaking Agents (Vegetable Source Magnesium Stearate, Silicon Dioxide).